Several major companies in the toys and games industry have invested in a California-based startup that builds immersive games and content for its flagship iPad accessory.TechCrunch reported that Osmo, “an early entrant in IoT toys,” has raised $24 million in funding from Mattel, Sesame Workshop, Houghton Mifflin Harcourt and several venture capital funds. Osmo’s gaming system, designed for children ages 5–12, utilizes its own Reflective Artificial Intelligence technology to integrate physical puzzle pieces, blocks and other toys into a digital environment. With Pizza Co., for example, students learn business and math skills as they run their own virtual pizza shop using tangible money tiles that register on their iPad. Osmo will use this round of funding to adapt some of its popular toys and games for smartphone use. The startup also plans to produce more character-driven content for its products through its partnerships with Sesame Workshop and Mattel. Since its launch in 2013, Osmo products have been used in more than 22,000 schools across 30 countries, according to its website. 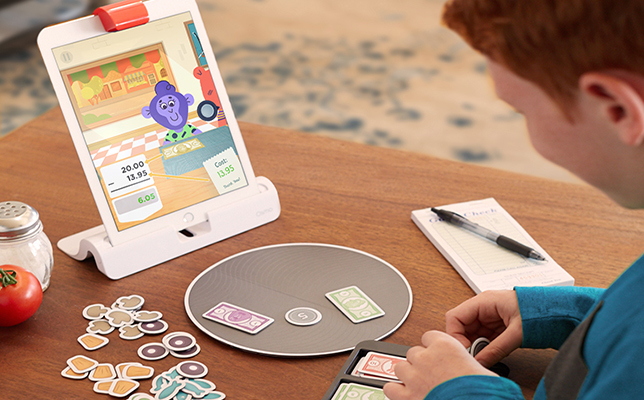 Osmo’s core game system costs $29, while games and packs range in price from $29–49. Several kits are available for $99–$189. Further information is available on the Osmo site.